Note from the editors: The following interview with Alena Krempaská was conducted by Mattia Gallo in the days following the protests in Bratislava. 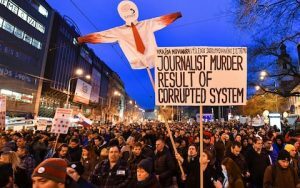 Mattia Gallo: On Friday, March 9, 2018, tens of thousands of people animated the center of Bratislava in a peaceful demonstration against the government of Prime Minister Robert Fico to ask the truth about the murder of the Slovak journalist, Jan Kuciak and his girlfriend, Martina Kušnírová. 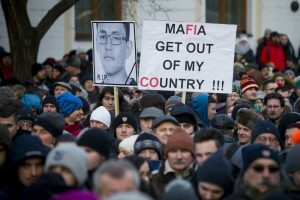 Kuciak, who was shot dead on February 25, was investigating the presence of activities of the Calabrian ‘Ndrangheta in Slovakia. What were the slogans and the biggest demands of people taking to the streets to protest? What were the main reasons for the protests in your opinion? Alena Krempaská: The story is far more complicated. There has been a serious miscommunication and an ongoing political demagogy around the issue, heavily strengthened by journalistic activism in virtually all mainstream media. In fact, there was an unfortunate communication from the president of the police who hinted, the very first day, that this might be a professional murder because of Jan Kuciak’s work. This story has been later questioned, and the police have announced that they are working with several scenarios. In fact, the officially confirmed details from the crime scene are as follows: there were three coffees in the house, the perpetrator apparently entered without using force and the two probably knew him, as the woman was shot first, sitting behind the computer, into the face (not into the head, but in the face), and the man in another room, with two shots in the chest. None of the two seemed to be making any moves to escape. Many confirmed that this does not look like a professional murder. All opinions and conspiracies apart, for now, it is entirely unclear whether the murder had anything to do with Kuciak’s work, as this could be a personal issue, or a completely different scenario. It might even be that they were shot because of her, not him. All possibilities are, as of yet, on the table. Given the crime scene, the police said they do not count on the Italian mafia vendetta scenario anymore. Nevertheless, the whole issue lives its own life, and has been heavily misinterpreted and misused both by the majority of journalists, who take the issue very personally and fear for themselves, and by the political opposition, who use it now against the government, creating an overall atmosphere of chaos and hatred. The whole issue is politically charged, and has far outpaced the murder. Now it’s really a vocal time for those who disliked or hated Fico’s social democrats and feel it’s their moment to bring him down (to explain this would make for a very long story on Slovak politics, the details of which I will certainly omit for now). When it comes to people in the streets, they came out for a variety of reasons, under a wide slogan “For a more decent Slovakia”, and generally, they just want to get rid of corruption and would like to see a decent government in place. It is hard to estimate how the general public perceives the whole issue. The people in the streets are not SMER social democratic voters; these voters did not go into the streets. These are people who precisely did not vote for SMER. They were also heavily influenced by the major opposition figures who have tried to take lead of the protests, use them for their own political ends to bring the government down and call for snap elections. The strategy seems to work poorly, and the best proof are the latest polls (as of March 14), comparing the gains between January and March 2018: SMER lost 5%, the opposition OLANO lost 1%, the real gains are, unfortunately, 2% for the neo-nazis and 1,5% for the far right ‘We are family’. An unforeseen consequence of this whole very unfortunate affair of opposition parties’ political PR will be the gains for the far right. Mattia Gallo: The protests have been defined as the biggest since 1989, when people took to the streets against the communist regime. How did neo-liberalism define Slovak society in these thirty years? Do you believe that there are social issues behind the protests against the government? What have been the effects of the international financial economic crisis on Slovak society in these years? Have austerity policies been applied? Alena Krempaská: There is a variety of reasons behind the protests. They were certainly sparked by the murder, which seemed so shocking and unbelievable for our country (at the time, many counted, and still count, on the belief that the murder was politically motivated). People were also shocked because these were two young people, which is reminiscent of a murder in 1988. The whole framing as a politically motivated attack by the forces close to the social democrats (yet again a very far-fetched claim that in reality does not make any sense), scared people and persuaded them something has to be done. People in the streets out there are not necessarily for an opposition government, they generally want a better country, less problematic, less corrupted. This is a country where neoliberalism was injected 29 years ago. Austerity has been there from the very beginning of modern Slovakia. People have not even noticed the whole debate on austerity that has taken place across Europe over the past years; here, there was no change. We were lucky to pass the crisis of 2008 more or less intact. The regional disparities are striking though, and the price levels are rising, slowly curtailing people’s wellbeing and standards of life. The overall atmosphere is that of frustration. Mattia Gallo: How do you think the political and juridical authorities will react in the next few months with respect to the case of Jan Kuciak’s murder? Will it be possible to get to the truth? What do you think are the most damaging effects of the presence of the Calabrian ‘Ndragheta in a country like Slovakia? Alena Krempaská: I am 100% persuaded there will be the biggest possible effort to find out the truth about the murder. As the events show, it is impossible it was ever spearheaded by SMER, as this could potentially kill them politically. Quite the contrary, they will try their best to investigate to clear their names. It has already been announced that there is the most massive investigation team involved, with not only the best Slovak policemen, but also with the help of foreign intelligence and police teams. Struggle in Nepal. Interview with Bikkil .. It is beyond improbable that there will be any interference with the investigation: in a climate such as this and with media openly hostile to the government, there could be at any moment a whistleblowing policeman or investigator who would talk to the media the very moment he felt under pressure. Moreover, this is also a moment for personal initiative, and I can very well imagine there will be investigators who will try their best to investigate such a high profile case for the sake of their own career or their own satisfaction at being the one who found justice in the case. On the other hand, in such a heavily charged political climate, it is a completely different matter whether people will believe the outcome of the investigation. 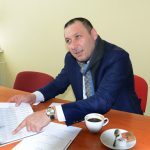 When it comes to the ‘Ndrangheta in Slovakia, little is known of their presence, and it is not 100% clear that these Italian ‘enterpreneurs’, Antonio Vadala and the Roda brothers, are really directly linked to the mafia group. They behave as regular Slovak enterpreneurs making money out of eurofunds, and it was confirmed they have received the funds from different governments, not only from the social democrats, which makes the claim that they are very tightly linked to SMER rather obsolete. 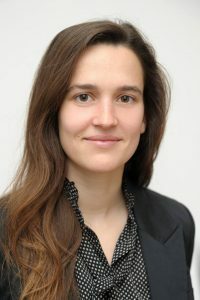 Alena Krempaská, is a program director of the non-governmental organization Human Rights Institute, based in Bratislava, Slovakia. Known for her human rights work and anti-corruption activities, she is also a regular commentator for Pravda daily and a member of DiEM25.